Grace’s is delighted to welcome Bob Ballard as the club’s Honorary President. Bob is a highly respected broadcaster on BBC Radio and Television. 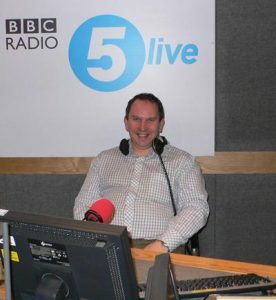 He is the BBC Radio swimming commentator, and also commentates on basketball and ice hockey. He is the BBC TV commentator on diving. During the last eleven years Bob has covered three Olympics, two Winter Olympics and three Commonwealth Games, along with five world long course swimming championships. In his blog, Bob says “I was born just a few hundred yards away from Lord’s Cricket Ground in the Autumn of 1959 which would explain why cricket was my first real love and I was a Middlesex junior member”. Bob has his own website, which you can find at http://www.bobballard.net/. Grace’s CC is very grateful to Bob for his support, and we very much look forward to working with him over the coming years to promote the objectives of the club.